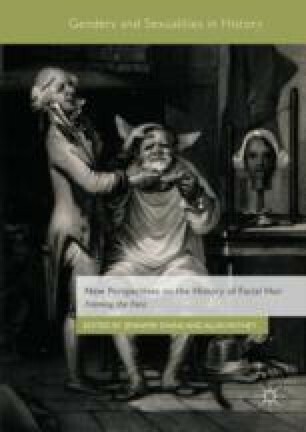 Recent scholarship on the early modern body has shown that features such as hair are repositories of cultural meaning, with beards, particularly, emerging as powerful tools of self-fashioning. However, this research is rarely applied to studies of colonialism and nationhood which continue to privilege skin colour as the marker of difference, despite the fact that hair and beards were a key way through which travellers imagined their dissimilarity from other cultures. The author considers representations of English/non-English bodies to demonstrate that defining the ‘other’ was an unstable project, especially when difference was located in facial hair, a malleable and mutable substance. The fashioning of English manhood through hair was therefore a beleaguered task, meaning that the writing of foreignness frequently collapses in on itself to problematise the Englishness it fantasises as stable.